Spoken in the language of Tevye and his daughters, this revival loses the humor, but brings out the pain. Lane Williamson reviews. Yiddish made a notable return to the New York stage in 2016 when Paula Vogel employed the language in her play, Indecent. There, the use of Yiddish gave the characters an immediacy that connected the present to the past; in resurrecting the language theatrically, the characters were similarly risen from the ashes of time. By design, Indecent felt like an elegy, for a people and for a language. 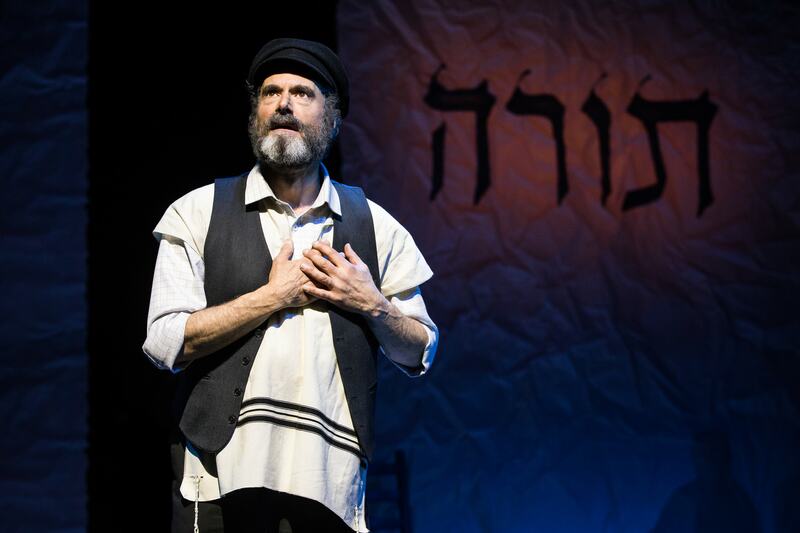 In The National Yiddish Theatre Folksbiene’s production of Fiddler on the Roof, however, Yiddish is far from dead. The production uses an entirely Yiddish translation of the well-known musical, replacing the 1960s American-English libretto with the native language of its characters. The Yiddish removes the story of Tevye and his five daughters from its musical comedy foundation and refashions it as a darker musical drama. By repositioning the language, it refocuses the narrative. At times, it is startlingly successful; at others, the beloved musical loses what makes it great. In most shows of Fiddler’s period, there is a particular cadence to the language, a musicality to the dialogue, a pop to the jokes that is very telling of musical comedy. In Fiddler, it’s the language of the Borscht Belt. Joseph Stein’s book takes this sensibility and puts it in a turn-of-the-century Russian shtetl. The characters, obviously, did not speak to each other in real life like Stein’s characters do, but he was writing a musical, not a docudrama. Shraga Friedman’s translation attempts to capture the humor, but is never quite successful. Reading the jokes in Matthew (Motl) Didner’s supertitles does not have the same zip as hearing them delivered by a Jewish comedian, how Tevye is often cast. The translation also runs into trouble when it comes to Sheldon Harnick’s lyrics, especially where they are tied to a strict rhythmic melody by composer Jerry Bock. A waltz like “Matchmaker, Matchmaker” requires that the lyrics stay rigidly within its three-beat meter, which Harnick does splendidly. In more rhythmically challenging songs like “Now I Have Everything” or “Miracle of Miracles” the lyrics have to stay with the melody, leaving space where the rhythm dictates and riding the notes the rest of the time. Friedman’s translation, most of the time, does not add or subtract syllables, but the cleanness of Harnick’s word choice, the shift between staccato consonants and legato vowels, is lost and the songs do not retain their pleasure as a result. The translation is effective overall, though, in establishing a new mood and tone for Fiddler on the Roof. It’s easy to write off Fiddler as a story about an old man resistant to change, but when delivered in Yiddish and stripped from its comedic backing, Tevye’s struggle to accept the changing world around him is more potent. The rippling effects are heightened and the future is more dangerous and uncertain. Joel Grey’s production emphasizes the serious over the romantic as well. The destruction of Tsaytl and Motl’s wedding is not how the act ends, which is usually the case. Grey lets us hear that the violence extends into the village, beyond what we can see. It is a reminder that Tevye may be telling us the story, but he is not the only person who exists – there are many other lives just out of sight. For a show that begins with a celebration of community (the opening number “Tradition”), it is a particularly strong choice to remind the audience that said community is also at risk. Steven Skybell’s Tevye is warm and charming when he needs to be, but Skybell has two moments that paint Tevye as deeper and more emotionally rich than most portrayals. The first occurs in “Do You Love Me?”, a duet between Tevye and his wife, Golde (Jennifer Babiak). The song is usually played for laughs with Golde squawking at Tevye, ignoring his attempts to have a serious conversation about their relationship. In keeping with the more somber tone, Skybell and Babiak play the song as a quiet conversation – it is difficult for both of them to talk about something like love. Skybell connects the beginning of the song to his daughter’s decision to marry someone she loves rather than someone selected for her by the matchmaker, clearly showing how Hodl has made him reconsider his own life. It is a psychological connection that is often overlooked, but Skybell makes that minor transition into a major event for the character. Skybell is also extraordinary in the scene where Tevye rejects Khave (Rosie Jo Neddy)’s announcement that she will marry outside the Jewish faith. It is a shocking moment when Skybell has Tevye’s heretofore calm, even demeanor unhinge into a vicious dismissal not only of the proposed marriage, but of Khave herself. And it is similarly shocking to see what happens to Tevye immediately after this moment. Even as Tevye moves on from the moment and Khave recedes offstage, there is a hollowness to Skybell’s performance through the end of the play, a Khave-shaped hole in the man we have come to know. Having moved uptown from the Museum of Jewish Heritage, where it ran for six months, the production does show signs of wear and fatigue. Skybell’s performance does not exhibit these markers, but some of the cast has a lack of energy not uncommon in a long run. In the moments where the show really clicks, it’s breathtaking. One wonders if there were more of these when the production had just begun. Overall, though, it’s an audacious rendering of a musical most people know all too well and a bold reinvention is always welcome in my book.